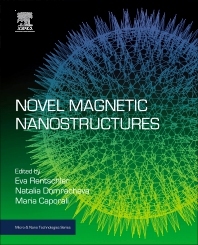 Novel Magnetic Nanostructures: Unique Properties and Applications reviews the synthesis, design, characterization and unique properties of emerging nanostructured magnetic materials. It discusses the most promising and relevant applications, including data storage, spintronics and biomedical applications. Properties investigated include electronic, self-assembling, multifunctional, and magnetic properties, along with magnetic phenomena. Structures range from magnetic nanoclusters, nanoparticles, and nanowires, to multilayers and self-assembling nanosystems. This book provides a better understanding of the static and dynamic magnetism in new nanostructures for important applications. Dr. Domracheva was a leading researcher at the Laboratory of Molecular Radiospectroscopy, part of the Kazan Physical Technical Institute RAS. Her primary research areas included metal-containing dendrimers, magnetic nanoparticles, iron-containing magnetic nanostructures with thermos- and photo-controllable properties, and magnetic clusters. Maria Caporali is a Researcher in the Institute of Chemistry of Organometallic Compounds at the CNR in Florence, Italy. She is involved since many years in Phosphorus chemistry, including the activation and functionalization of white phosphorus with metal complexes, the synthesis of metal phosphides nanoparticles and their application in catalysis, and lately the functionalization of phosphorene, the P-analog of graphene, with transition metal nanoparticles. Dr. Rentschler is a professor in the Institute of Inorganic Chemistry at the University of Mainz where she is responsible for managing the subject of bioinorganic chemistry. Her research involves the investigation of bio-inspired systems, inorganic and organic materials, molecular magnets and correlated spins. She leads a group whose current projects include focus on molecule-based magnetics, polymetallic exchange coupled systems, high nuclearity spin clusters, mixed valence complexes, ferric ring systems, butterfly-like complexes, and stable radical ligands.